Every year in Asheville, NC, trees topple over or break apart. These occurrences stem from many factors. Despite the majestic look of many trees, it is important to remember that they can and do fall victim to the forces of nature. All tree failures are not foreseeable. No one can control the damage that a hurricane or ice storm may cause. However, many tree catastrophes can be avoided. Servicing all of Asheville, NC, Family Tree Services can perform a top notch hazardous tree inspection. This can help to ensure that your tree does not fail. Property damage, injury to people and power interruptions can all be avoided with effective and regular tree inspections. What Is Hazard Tree Inspection? Hazard Tree Inspection is sometimes commonly known as tree risk assessment. Simply defined, the process involves using various methods to assess the health of a tree. Ultimately, the objective is to detect vulnerabilities and/or complications that can put people or property at risk for damage. Family Tree Services has a wealth of knowledge from years of experience with tree maintenance. We can provide expert recommendations on exactly which measures should be taken to lessen or eliminate tree risk. At the same time, we will keep your budget in mind. Keep in mind that many species of trees will display different types of features. Also, many trees will look different at certain times of the year. Differences also will be present during their various phases of development. Therefore, it’s important to call Family Tree Services to receive an expert tree inspection from skilled and knowledgeable associates. How Are Trees Evaluated to Determine a Potential Hazardous Situation? Trees are examined by assessing four different areas or “zones”. Tree zones are classified as follows: Zone 1 = the entire tree, Zone 2: the ground underneath the tree, Zone 3: the tree trunk and Zone 4: The canopy of the tree. When beginning the inspection, the first step is for the examiner to position themselves in a place where the tree can be seen in its entirety. Inspection of zone 1 does not focus on any individual parts of the tree. Aspects of zone 1 inspection include observing if the tree is leaning. If the tree is leaning, the length of time that the tree has been leaning should be determined next. The direction of the lean is equally as important. Trees which lean toward the east tend to be more susceptible to falling as winds travel from the west. Evidence of large, dead branches along with their location on the tree are also part of the inspection. Lastly, zone 1 calls for determining if leaves are sparse or if there are areas on the tree that contain no leaves. If any parts of zone 1 inspection yield unwanted findings, it could very well mean that the tree could fail one day. This means that you should call Family Tree Services as soon as possible. The second zone inspection is designed to evaluate the ground underneath the tree. This is comprised of any noticeable roots and the first 36 inches of the tree trunk. Visible roots are inspected since they provide anchoring for the tree. Trees that appear to be lively and robust can still show evidence of future hazards if there are problems with the roots. For instance, if there is noticeable soil that has been raised from the ground, it is an indication that the tree may be uprooting itself. Any mushrooms that are present on or near the roots are an indication of a fungal infection. Fungus can rot the tree roots and the trunk resulting in a trunk that can split or break. Other zone 2 evaluations include looking for sawdust at the base of the tree. If this is noticed, it is an indication that the tree is harboring carpenter ants or has an infestation of borer beetles. Either of these pests can potentially kill a tree. In zone 3, the tree trunk is up for inspection. This is one of the most important parts of a tree inspection as the trunk holds up the tree and provides support to the branches. Signs of potential tree fail include cavities and or cracks in the trunk. If either of these are present, this means that the tree could be a ticking time bomb and could fall over any day. Sections of the trunk that have missing bark are frequently indicative of a dead area of the tree. This is usually caused by a fungal attack. One of the most extreme tree conditions in zone 3 that raises alarm is a tree that has more than one trunk. It’s important to regularly inspect the area where the trunks meet. Finding a colored line that is lighter than the color of the bark suggests that a new crack has formed. In this instance, drastic measures must be taken to preserve life and property. Finally, zone 4 involves inspection of the crown of the tree. The crown is made up of all the tree branches and their leaves. In zone 4, the objective is to look for dead branches which are evidenced by brown or missing leaves. Branches that have been dead for a long period of time will contain no bark. This presents a dangerous situation as dead branches can easily break off. 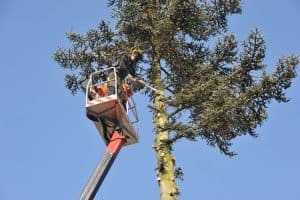 Family Tree Services can safely remove these branches so that they do not cause injury to someone or damage to property. The most essential take home point is that it’s important to have trees evaluated often. Trees are strong and self sufficient for the most part. However, sometimes they need our help. If there is anything abnormal that you notice about your tree, don’t ignore it! It is better to be safe than sorry. Call Family Tree Services today. We can help you maintain your piece of mind so that you can experience years of enjoyment from your beloved tree.